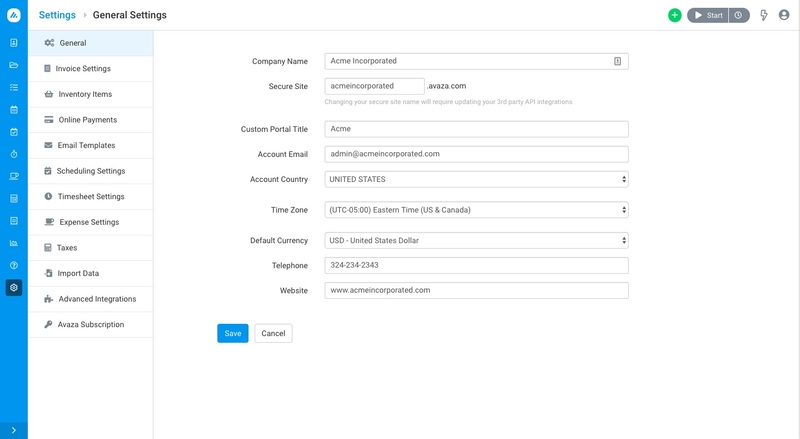 Learn how to update your account’s General Settings, and make changes to your custom portal title, company name and more. You can update your account’s general settings such as timezone, currency and account email via Settings > General. The Company Name you used while setting up your account will be displayed by default but you can update this if required. The custom domain you used while setting up your account will be displayed by default but you can update this as needed. This makes up the URL your team uses to open Avaza. The default Custom Portal Title is Avaza. You can see this in the top left corner of your app screen. You can change this so your team can quickly see which account they’re on. By default, we send subscription payment notifications to the user that creates the account. You can update the account email here to change where these emails are sent. The Country you entered while setting up your account will be displayed by default but you can update this if required. Task start & due dates, as well as the generation time for recurring tasks, expenses and invoices is based on your account time zone. Reports also allow you to view data in either the account timezone or user timezone (found under User Profile). Please note that you will be unable to change the currency if there are any transactions in the system. Please delete the transactions if you want to change your account’s base currency. Enter your business telephone number here if needed. You can enter your website URL here if desired. Need any help managing your General Settings? Feel free to get in touch with our support team via chat or email.